The latest rankings by U.S. News and World Report place 14 UAlbany graduate programs in the nation's top 25. 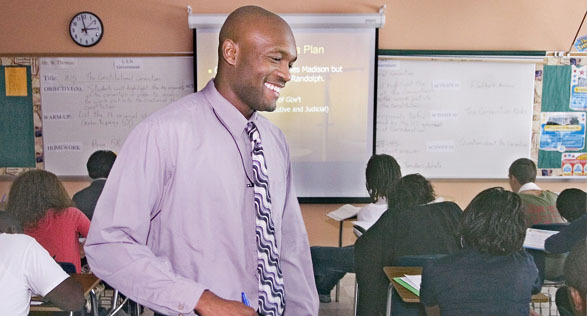 For UAlbany alumnus William Thomas, being named Maryland's 2009 Teacher of the Year has its perks: a new computer, $9,000 in cash and a new $25,000 Saturn Aura. But the biggest reward will be meeting President Barack Obama, when Thomas is honored for his accomplishment at the White House in April. "It's important to reach students on their level to bring them to a higher plane," said Thomas, who teaches government at the Dr. Henry A. Wise Jr. High School in Upper Marlboro, Md. In his own life, Thomas has relied on encouraging influences. Growing up in the small town of Ellenville, N.Y., parents Eunice and George Thomas instilled the importance of education, inspiring his path to teaching. While pursuing his degree at UAlbany, he thrived in learning about the diverse cultures in history and social studies classes. He enjoyed the diverse atmosphere and student body at the University and was also challenged by the high expectations of his UAlbany professors. Today, Thomas does the same for his high school students. "I want all of the students to believe that I will not give up on them, that I will push them until they succeed," said Thomas. In doing so, Thomas has become a role model, particularly to African-American students -- a responsibility that he relishes. He dresses in a shirt and tie everyday, putting into practice the high standards that he preaches in his classroom. Thomas has been approached several times about becoming an administrator in the Maryland school system, tapped for his skills and dedication to his students. But he is unwilling to give up his life calling: teaching. In fact, it's a household calling -- his wife Nicole, a '96 and '98 graduate of UAlbany, is a 10th grade English teacher at the same high school. Married in 1999, they met at UAlbany, where the couple shared an interest in the gospel choir and a passion for teaching. Last April, both were finalists for Prince George County's teacher of the year. 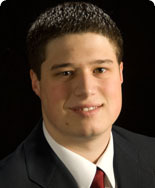 William Thomas garnered the recognition, leading him to the statewide award, which he received by besting seven candidates from other counties. Still, he maintains he's not the best teacher -- not in the state or in his house. "My wife is the better teacher," Thomas said with a laugh. "It's not even close."